This sturdy shower stool is perfect for smaller bathtubs or shower stalls or for situations where you prefer a more compact bath chair. It's easy to push to the side when not in use and won't get in your way. And you can even use it as a vanity stool. The height is easily adjustable from 15.5 to 20 inches and the rubber-tipped legs give you stability on wet surfaces. What's unique about this shower chair is that it resists the growth of harmful germs with the power of a unique blend of natural antimicrobials. BactiX. antimicrobial shields against odours, moulds and stains as well as other bacteria including staph and E.coli for the life of the stool. It's very easy to assemble with no tools. It will be ready and waiting for your next shower in minutes. This compact shower stool is great for smaller bathtubs, shower stalls, RVs and boats. Also works well as a shaving stand or vanity stool. BactiX antimicrobial shields against odours, moulds and stains as well as other bacteria, including staph and E.coli. It's easy to adjust the height from 15.5 to 20 inches in 1 inch increments. 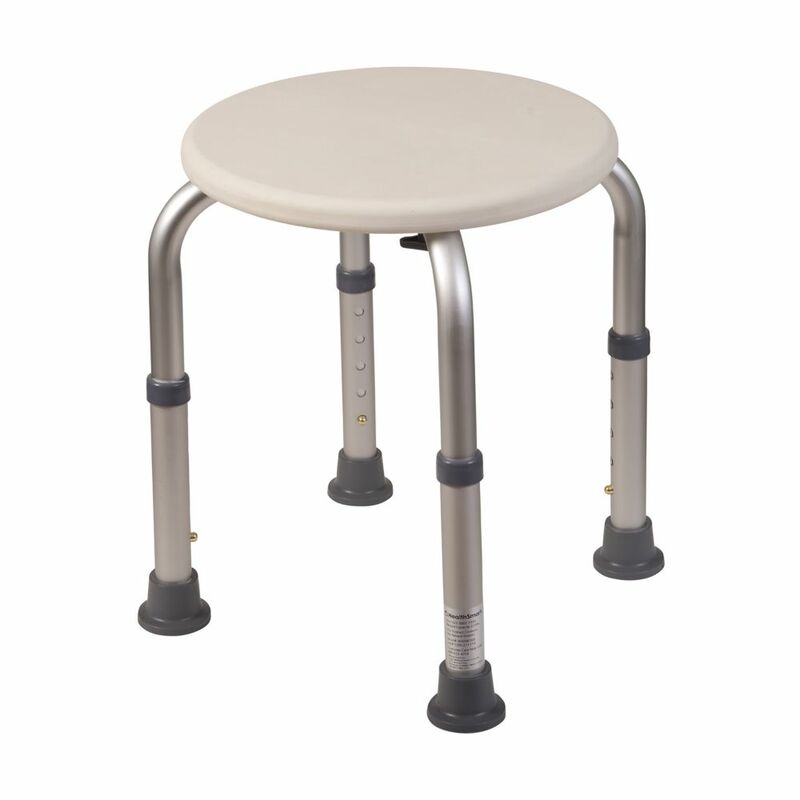 Rust-resistant aluminum legs with slip-resistant rubber tips give you stability on wet surfaces. Comfort meets classic styling in the elegant Avery barstool. The seat of this sturdy 29-inch barstool is covered with a neutral blue fabric and rests on a dark rubber wood frame that will effortlessly complement a wide variety of interiors. A detailed nail-head trim adds a timeless visual accent while also reinforcing the seams of the durable 100% polyester fabric. This comfortable upholstered barstool is a stylish accent for a bar or a kitchen island, and the webbing seat structure of this chair ensures it will stand up to regular use with ease. Complete the look of your dining or home-entertaining space with several of these versatile chairs. Combining a vibrant, modern look with practicality, this high chair is an ideal match for a kitchen dining area or as a classy bar stool in the den. Relax on the high-density foam seat covered in durable faux leather. Add a pop of color to any room thanks to the striking colour finish, which combines with the clean lines of the stainless steel legs to bring a modern air to your kitchen or den. Suitable for just about any dicor, this high chair is sturdy and the fabric cover is easy to maintain. Line up four along a counter or bar and create a fun atmosphere in the room. Compact Lightweight Shower Stool This sturdy shower stool is perfect for smaller bathtubs or shower stalls or for situations where you prefer a more compact bath chair. It's easy to push to the side when not in use and won't get in your way. And you can even use it as a vanity stool. The height is easily adjustable from 15.5 to 20 inches and the rubber-tipped legs give you stability on wet surfaces. What's unique about this shower chair is that it resists the growth of harmful germs with the power of a unique blend of natural antimicrobials. BactiX. antimicrobial shields against odours, moulds and stains as well as other bacteria including staph and E.coli for the life of the stool. It's very easy to assemble with no tools. It will be ready and waiting for your next shower in minutes. Compact Lightweight Shower Stool is rated 4.8 out of 5 by 36. Rated 4 out of 5 by Judith from Not a completed item It was fine.... Not a completed item It was fine. Rated 5 out of 5 by HomeDepotCustomer from just what we expected it to be. very sturdy in... just what we expected it to be. very sturdy in the tub. Rated 5 out of 5 by Violet from Light & easy to handle but built sturdy. One thing I like to have little more shorter option avai... Light & easy to handle but built sturdy. One thing I like to have little more shorter option available for short senior. Thank you for the good product! Rated 5 out of 5 by homeowner from This was a little trickier to assemble than I though it would be because I had to line up the par... This was a little trickier to assemble than I though it would be because I had to line up the parts just right. Also, I'm pretty sure it was missing a washer for one of the screws. It still works fine, though, and in general it was not difficult to assemble. I like it! Rated 5 out of 5 by Warren from The seat was very easy to put together and is... The seat was very easy to put together and is very useful. I keep it in front of my bathroom vanity so I can remain seated while I wash my hands, shave, and get dressed. I recommend it highly. Rated 5 out of 5 by Douglas from Great product!... Great product!